Simply gorgeous and charming! This captivating combination will look good in any room and wonderful if presented as a gift. 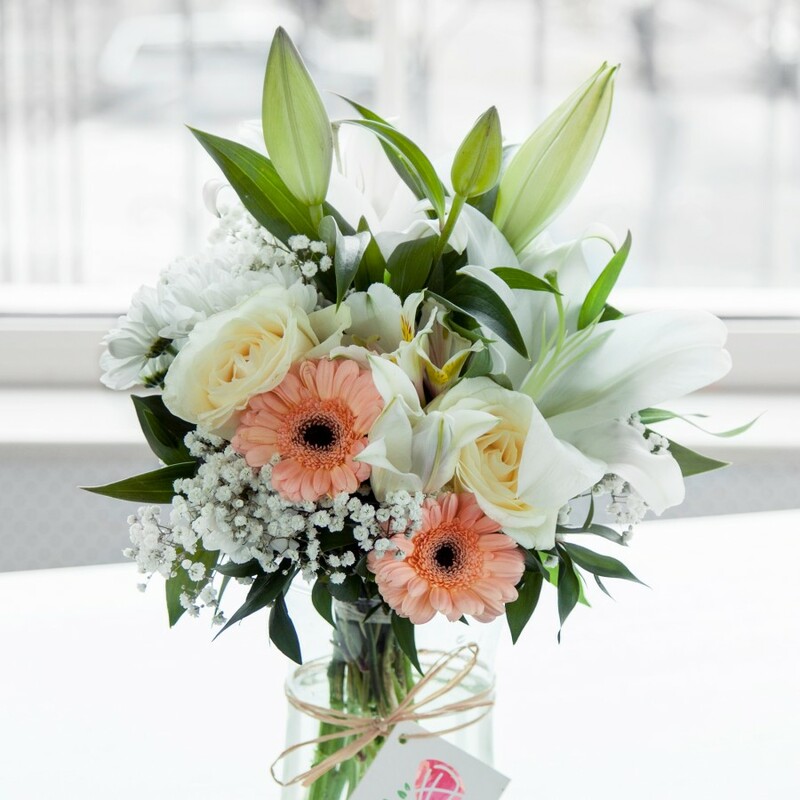 Featuring creamy white roses, peach germini, luxurious white lilies accompanied by white chrysanthemums, alstroemeria and gypsophila. Original Bouquet contains 11 stems. It took me quite a long time to choose a bouquet as I found all of them very beautiful. The one that I ordered for my wife's birthday arrived perfectly safe. It was everything I'd imagined! Lovely surprise gift from my husband. The bouquet was delivered early in the morning and the flowers were excellent. I've never received anything quite as beautiful as this bouquet! The flowers were fascinating! The flowers in the bouquet I chose were in gorgeous shades that complemented each other very well. Really liked the combination and the affordable cost too. Ordered this beautiful bouquet for my mum from this online flower shop. It was delivered right on time and looked absolutely mesmerising! 5 stars! I loved how well the different flowers were combined and how fresh they all were. Bought a bouquet from this flower shop for my mum’s 50th birthday. I chose Angel because of its vibrant look and creative design. My mum liked it very much too. Angel was everything I hoped it would be. Really needed something that little bit special and this bouquet definitely is. Delivery was spot on – beautiful flowers and arrangement – thank you. Straightforward to use, great pricing and speedy delivery. Great range to choose from and fantastic pricing. You made my daughter’s birthday incredibly special with THIS PRODUCT. She was so surprised when the delivery arrived and was so pleased with the beauty of these flowers. I know both she and I will be using you again – thank you! Ordered these flowers for my Mum’s 80th birthday. The flowers arrived in a beautifully presented bouquet. She was thrilled with the flowers and kept showing all of her friends!